The first and most daunting step when making cold process soap at home is making the lye-water mixture that is needed. Don't do this until you are ready to proceed with making soap from scratch. Lye is a caustic, dangerous chemical that can cause serious burns, but you can work with it safely if you take a few precautions and understand basic soap making safety procedures. Chose a soap recipe and assemble all its ingredients and tools. Read through and understand each of the steps involved in making a lye solution. Making lye-water is the first step in the soap making process; you need to be ready to proceed with the process after the lye-water is made. Your soap making recipe will list the specific ingredients, but most soaps require the same basic ingredients and equipment. In soap making, everything is measured by weight, even the liquids, which is why it is important to use an accurate scale and know how to zero it out. Put on the safety goggles and rubber gloves. Leave them on throughout the soap making process. Put the pitcher on the scale and zero out the weight. 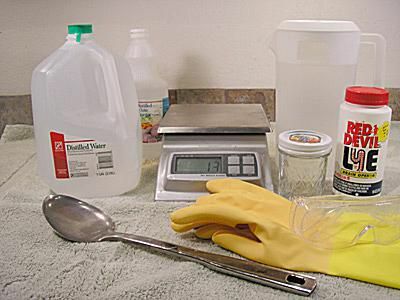 Weigh the amount of distilled water called for in your soap recipe. Place a mason jar, plastic pitcher or other solid, safe container onto the scale and zero out the weight. Open the container of lye and gently shake out the amount you need for your recipe. As soon as you have the correct weight measure of lye, you must tightly close the lid on the lye container and put it aside in a safe place. Be cautious that no stray beads or specks of lye fly up and stick to your gloves or shirt sleeves. This is more likely in dry climates or dry weather when there is a lot of static cling. If this happens, stop and clean them off immediately. If your recipe calls for adding sugar or salt to the lye water solution, add it to the water before you add the lye. Stir the water well to make sure the sugar or salt is completely dissolved and then move on to adding the lye to the water. Slowly add the lye to the pitcher of water. Be careful not to splash. CAUTION: Always add the lye to the water, not the other way around. Adding the water to the lye can cause a volcano-like reaction in the pitcher. Do not breathe the fumes given off by the mixture. Open windows or turn on fans while working. The mixture will start to heat up and may even steam or make bubbling or boiling sounds. This is fine. Continue to stir until the solution is thoroughly mixed. Safety note: Look closely at the spoon you used to stir the solution when you pull it out. You can see a few drops of lye solution still on the spoon. Rinse the spoon off or put it into a pitcher of water so that those stray drops of lye don't come into contact with something they shouldn't. After stirring, put the lid on the lye-water pitcher and set it in a safe place to cool. The lye is ready to use when it cools down to about 100 degrees Fahrenheit. Even when the lye-water is placed aside, you still need to be safe. Don't put it in a place where pets or children can knock it over. If there are other people in the house, label the pitcher "DANGER-Lye Solution." The mixture is hot when you first mix it—often as much as 200 F. Don't place it near anything heat sensitive. Take a Breath—You've Done It! If there's any one thing that keeps people from trying cold process soap making, it's fear of dealing with lye. But look—you've done it and done it safely. As long as you always follow proper safety procedures, wear your goggles and gloves, and don't shortcut the steps, you should have no problems at all safely mixing lye to use in your soap making. Now that the lye-water is made, the hard part is done. It is time to proceed with making the soap following your chosen recipe.